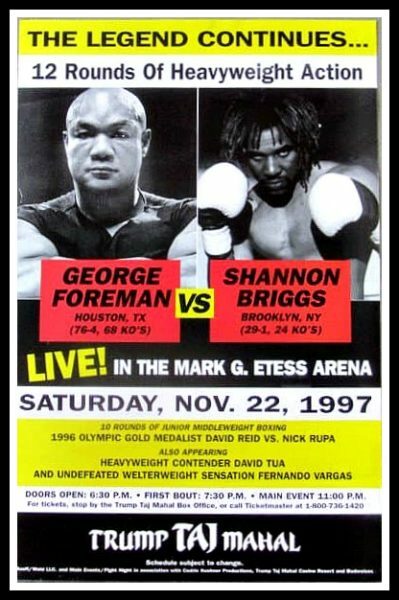 Atlantic City – On Saturday, November 22, 1997, Kathy Duva’s Main Events brought to Atlantic City’s Taj Mahal Hotel and Casino’s Mark G. Etess Arena, “Big” George Foreman vs. Shannon “The Cannon” Briggs for the Lineal Heavyweight Championship of the world. After his monumental November 1995 win over Michael Moorer to win the IBF, WBA and Lineal heavyweight titles, Foreman was subsequently stripped of recognition from the two major sanctioning bodies but maintained his lineal status. This meant that even though the IBF and WBA no longer recognized him as their champ, he was still the – Man who beat the man – because no one actually beat him in the ring to take those laurels. It was the 48-year-old Foreman, 76-4, 68 KOs, looking to remain on top, versus the 25-year-old Briggs, 29-1, 24 KOs, attempting to become “The Man” or at least a very key player in the heavyweight picture. In round one, Briggs threw his jab and used his legs to stay away from Foreman’s shots, but as early as the third round, started to show signs of fatigue. 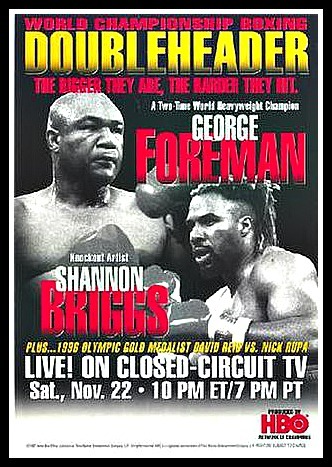 Foreman played the aggressor while Briggs fought in retreat for most the fight. The Brooklyn native did land his share of blows, but it was “Big George” who started landing big shots as the fight progressed. Foreman used his big jab and overhand right to help move an already retreating Briggs around the ring. Briggs looked to make his 23-year age advantage work in his favor, but as the fight went on, experience and determination seemingly overshadowed youth. 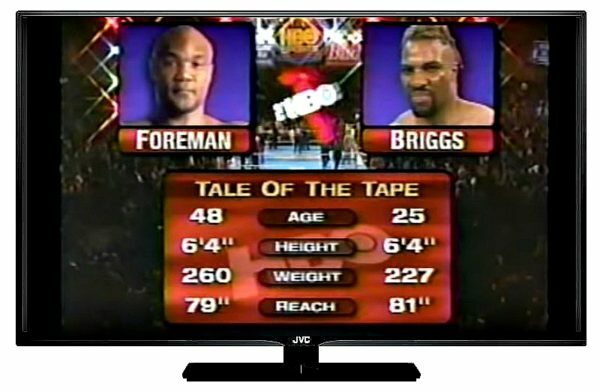 Down the stretch, Foreman tried hard to score the knockout, even breaking Briggs’ nose in the last round, but Briggs persevered. Ultimately, the fight went the distance and the decision was in the hands of the judges. The scores read 114-114 even on one card, while the other two cards read 113-117 and 112-116 in favor of Briggs. The decision was met with boos from the crowd with many thinking Foreman should have gotten the decision. Controversy swirled for weeks afterward with calls for investigations into the decision being brought from not only Foreman and his handlers, but also from people like Senator John McCain. But in the end, Briggs still was the split decision winner and new lineal champion. Briggs’ victory landed him a shot at Lennox Lewis’ WBC crown, being floored three times and ultimately being stopped by 5th round TKO. After a proposed fight with Larry Holmes fell through, the Briggs fight would turn out to be Foreman’s last bout. On the undercard, up and coming star, Fernando Vargas, improved his record to 8-0, 8KOs, with a first-round TKO over Jose Miguel Fernandez. 1996 Olympic Gold Medalist, David Reid, scored a 5th round TKO over Dan Connolly, boosting his record to 6-0, 5 KOs. David Tua rebounded from his 12 round unanimous decision loss to Ike Ibeabuchi five months earlier with a 2nd round TKO over Jeff Lally, improving his record to 28-1, 24 KOs.